You may not have thought about it, but the fact of the matter is that the English word CASE is used in an awful lot of different English phrases that are applicable to a wide range of situations in life! Well, if that’s the CASE, I’m going to have to try and convince you, in which CASE there’s no better way of making a CASE than giving you a sentence just like this one! Or maybe you’re not convinced? Well, in either CASE you have to admit that whatever the CASE may be, the word CASE is indeed quite useful in making your point. 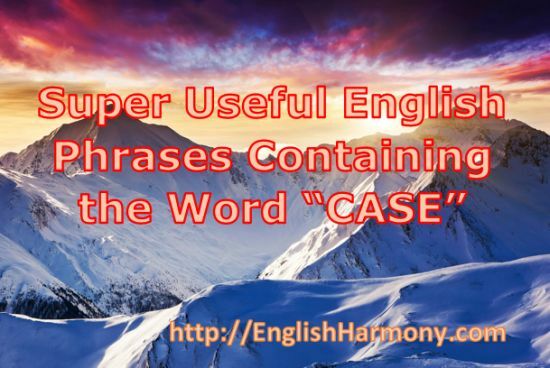 There’s a whole lot more useful English idiomatic expressions containing the word CASE worth knowing, and in CASE you’re wondering what they are, just keep reading this article and you’ll find it all out! Conversational phrases are the ones that can be used whatever the context, so they’re the ones you can use in pretty much any life situation provided that the phrase fits the statement type which could be a statement, a question, a response and so on. It’s not always the CASE – let me give you an example first and then you’ll see what this phrase is all about: “It’s not always the CASE that you’ll get a well-paid job after your graduation.” As you can clearly see, this phrase is used to state that something isn’t always true. It might very well be the CASE – this is just a smart way of saying “there’s a possibility that”, or “it could be”. So, why not just stick to “it could be”? Well, it might very well be the CASE that by using such and similar smart English phrases you would sound a bit more native-like thus making a better impression of yourself as an English speaker! English collocations (it’s just a fancy word for “word combinations”, read more about them here) are more specific than general phrases we looked at in the previous section. These are used in situations when talking about something more specific – the worst CASE scenario, for example, or calling someone a nut CASE. Nut CASE – do you know someone who’s completely mad and doesn’t behave like all normal people? Well, there’s a good chance that person is a complete nut CASE! Typically it’s someone who’s always getting into trouble and doesn’t care about the consequences of his actions. CASE study – you would come across this particular collocation when reading medical literature or some other kind of research where they’ve done a more thorough inspection of a specific animal, individual or a group of individuals matching certain characteristics over a certain period of time. “This particular CASE study is looking at a 40 year old Caucasian male having been suffering from asthma since his teenage years…” – you get the drift, right? Now, I tried to be thorough, but there’s always the chance that I might have forgotten a couple of important expressions containing the word CASE. If that’s the CASE, will you help me by posting them in the comments section below? A case in point – We should never take our opposition for granted. You never know they can turn around any time. Yeterday’s football match is a case in point. Team X which was considered as a weak team defeated Team Y,the strongest football team. Robby, thanks a lot.Your valuable response is very appreciated. I would surely go down the suggested line of advice and work on it. Sorry for the late response, been really busy in college and teaching my students! Actually wanted to get some advice from you. As far as my English is concerned, I would say I am completely fluent. Following your advice, I have hardwired my brain just to think in English, I talk to myself all the time in it and even I have been dreaming in English as well since a while now. 😉 But I still am having a few serious problems. I know it has been addressed to in your articles but some personal advice would be appreciated. Actually my problem is that I over analyse my speech a little too much. Everytime I say something, be it right or wrong, I would analyze it. And if I ever make a mistake then you could say all hells break loose within me and I go overtime to amend it and stress myself out over it. This makes my fluency disappear for a while and I feel so downcast and upset. Second problem is that I am very conscious of my English and whenever I have to speak amongst very fluent speakers I feel very intimidated and I would feel so daunted, conscious, fearful and nervous about it that I don’t feel comfortable speaking and always have a certain inhibition in speaking. As a result my fluency just goes haywire. And the last problem; whenever I am speaking and just because I am fluent in English and have enhanced my vocabulary after all this long practice, sometimes after speaking I would realise that I really performed well and I would have doubts that maybe I won’t be able to perform as good in the future and not come up with the right words anymore. This makes me feel downcast and kind of anxious and nervous. These are the only problems I have; besides these I am very fluent now.